BEIJING, Feb. 7 (Xinhua) -- The Spring Festival travel rush, originating from a long-held tradition for Chinese people to reunite with their families during the Chinese New Year, has now embraced numerous international elements. In addition to homebound trips, imported gifts and overseas holidays have helped redefine the travel rush, sending festive vibes across the globe. Four hours before the take-off of her flight for Beijing, Wang, who only gave her family name, has arrived at the J. F. Kennedy (JFK) Airport in New York City. She was among thousands of Chinese who are returning to China for the Spring Festival family reunion. "I really want to be with my family during the Spring Festival every year," said Wang, who came to the United States 17 years ago. This was her first time to go back home for the festival as it was the busiest time of the year for her company. Wang first flew from New York State to New Jersey before taking a bus to the JFK Airport. After 13 hours of flight to Beijing, she will board another plane for her final destination. Since Jan. 21, the passenger flow between New York and China has increased by 15 percent, and the total volume of luggage has soared by 20 percent, said Na Wei, chief of Air China's New York office. Many foreigners working or living in China also join in the largest annual human migration on the Earth. Macao has over 60,000 migrant employees from Southeast Asian countries, a large portion of whom will choose to go home during the Spring Festival holiday. In order to handle the rising traffic pressure, airlines from Macao International Airport will add 200 extra and charter flights. Living in China for 16 years, African businessman Felly Mwamba has followed the Chinese tradition of family reunions during the Spring Festival holiday. It's a long journey home. It takes him nearly 20 hours to fly from Guangzhou, where his company is located, to his hometown in the Democratic Republic of the Congo. The businessman said he was looking forward to gathering with his families and sharing his China story with his friends. Long distances and crowded journeys will not stop returnees from bringing their loved ones all kinds of festival gifts, among which imported products are common. Zhang Lu, a girl from central China's Chongqing Municipality, bought her father an imported healthcare product, which was sold for the first time on China's e-commerce platforms after the first China International Import Expo held in Shanghai last year. Thanks to the China-Chile Free Trade Agreement, Chilean cherries have become the superstar of fruit markets across China during the Spring Festival season. Chile's cherries, in both red and yellow variants, fit well with the festival culture in China, said Charif Christian Carvajal, marketing director for Europe and Asia of the Chilean Fruit Exporters Association (ASOEX). According to the ASOEX, exports to China account for over 80 percent of the country's total cherry exports. Stacks of orders from China keep logistics companies busy working during the whole travel rush season. "More than 60 percent of our business is related to China," said Ingo Grunwald, senior manager of German packaging and logistics company EPOLOG, adding that they were busier even before the Chinese New Year. In Sydney, Australia, there are many sales promotions for the Chinese New Year in shopping malls. Many of the goods were flown to China in the suitcases of the returnees. Mark Kozned, managing director of Nova Vita, a wine group in Adelaide Hills of South Australia, said "the Chinese consumers are looking for quality products" for the Chinese New Year. Spring Festival is a time for family reunion, which does not necessarily mean staying at home. Millions of Chinese travel with their families during a period of some 15 days before the Lunar New Year's Day on Feb. 5 this year and around 40 days thereafter, offering the global travel market tremendous opportunities. Ctrip, China's leading online travel agency, forecast that some 7 million Chinese tourists will travel to over 500 tourist destinations in more than 90 countries and regions during the week-long Spring Festival holiday on Feb. 4-10. Vincentius Jemadu, a senior official of Indonesian Tourism Ministry, said the country expected some 200,000 Chinese tourists during the Chinese Spring Festival holiday. "Since January we have carried out intensive tourism promotion in those destinations to gain momentum. We sold several New Year vacation packages in destinations preferred by Chinese tourists," said the official. Kong Sopheareak, director of the statistics and tourism information department at the Cambodian Ministry of Tourism, said "as I know, most of the hotels, particularly in Siem Reap and Preah Sihanouk, have been booked." In order to attract more Chinese tourists, Commercial Bank of Ceylon PLC, one of Sri Lanka's leading private banks, announced early January that Chinese tourists visiting the island country could pay for their goods and services through the WeChat Pay, a popular payment platform in China. Dozens of Chinese New Year celebrations, including concerts, night galas, parades, among others, are being held across New York City to welcome a flood of Chinese tourists. In Manhattan, a window display featuring the Chinese zodiac sign of pig designed by China Arts and Entertainment Group for the Year of the Pig has been installed in the landmark Empire State Building's lobby windows on the Fifth Avenue. Spectacular fireworks are expected to light up the night sky on Feb. 11 over the Hudson River in celebration of the Chinese Lunar New Year and honoring the 40th anniversary of China-U.S. diplomatic relations. 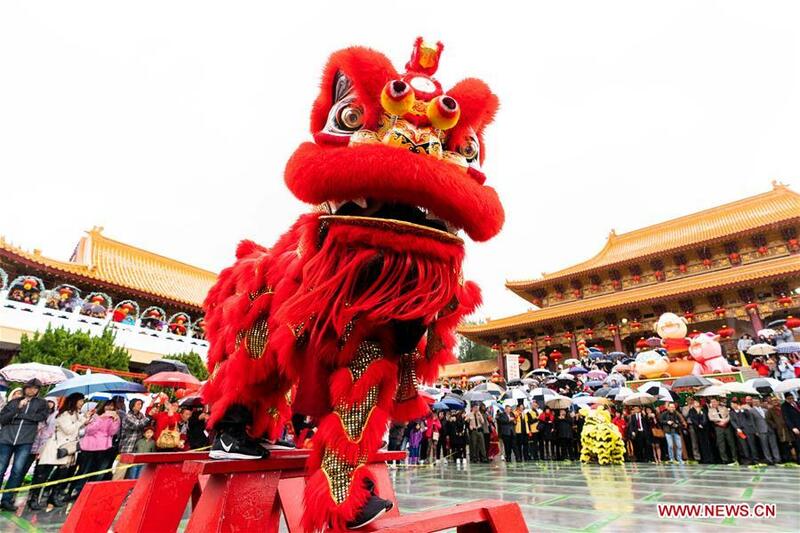 "Last year, more than 1.1 million Chinese tourists visited New York City," said Chinese Consul General in New York Huang Ping, adding that the celebrations will also allow "native New Yorkers to experience a bit of beauty of the Chinese traditional cultural festival."